In 1979, a Canadian hymnologist, Hugh D. McKellar, published an article, “How to Decode the Twelve Days of Christmas”, claiming that [the] lyrics were intended as a catechism song to help young Catholics learn their faith… McKellar offered no evidence for his claim and subsequently admitted that the purported associations were his own invention. The idea was further popularized by a Catholic priest, Fr. Hal Stockert, in an article he wrote in 1982… In 1987 and 1992, Fr. James Gilhooley, chaplain of Mount Saint Mary College of Newburgh, New York, repeated these claims. None of the enumerated items would distinguish Catholics from Protestants, and so would hardly need to be secretly encoded. See Twelve Days (above), and also 12 Things You Might Not Know About “The Twelve Days”. The latter noted the story that “from the 16th to the 19th century, when being a Catholic was a crime in Protestant England,” Catholic children used the song to learn their faith. I discussed the festival of the 12 Days of Christmas back on November 21, in On coming home from a pilgrimage and the coming holidays. 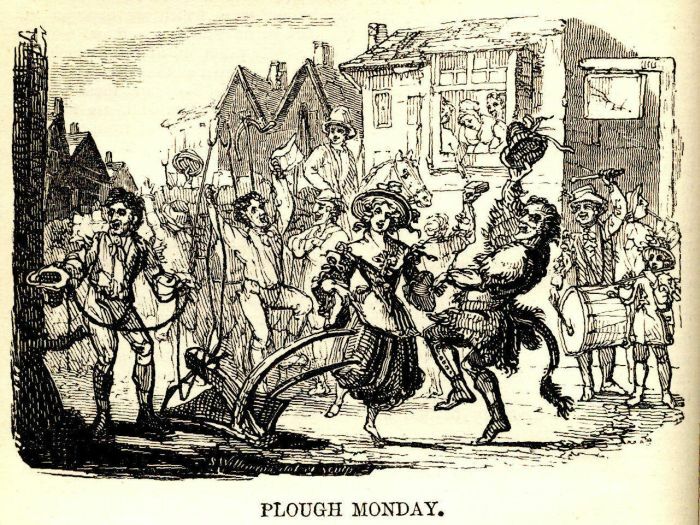 That post included such topics as the “old-time winter festival that started on Halloween and ends on January 6, also called Plough Monday.” It also discussed the fact that Shakespeare’s play Twelfth Night “expanded on the musical interludes and riotous disorder expected of the occasion,” that is, the “occasion of the ‘drunken revelry’ of 12th Night,” as shown by the King drinks painting above. So here’s wishing you a happy and prosperous 12th Night, Plough Monday, and/or whole New Year! The lower image is courtesy of Plough Monday – The Hymns and Carols of Christmas. See also Plough Monday – Wikipedia. And finally – for the sake of completeness – see Jeff Foxworthy – Redneck 12 Days Of Christmas Lyrics, and/or 12 Redneck Days of Christmas by Jeff Foxworthy – YouTube. This entry was posted in Feast Days on January 4, 2015 by dorscribe@aol.com.